Noms From Mom | Recipes and cooking adventures of two American-born Taiwanese sisters, as they follow in their mother's culinary footsteps and try desperately to avoid bringing shame to the family name. Recipes and cooking adventures of two American-born Taiwanese sisters, as they follow in their mother's culinary footsteps and try desperately to avoid bringing shame to the family name. For as long as I can remember, we’ve celebrated the Mid-Autumn Festival each year with delicious foods, friends, family and most importantly, mooncakes galore! Mooncakes are intricate pastries filled with a red bean or lotus paste and often includes an egg yolk (not my personal preference, but I’m also an ABC, so what do I know). Tonight, we ‘threw together’ a meal that, like always, left me in awe of my grandmother. Not because the meal was particularly complicated or unusual, but just seeing my nai nai in action is inspiring. She can barely walk a block without sitting down for a rest (she’s 90 – it’s cool), but get her in the kitchen, and she will take a cleaver to a bunch of cukes like nobody’s business. Lucky for us, that means we often get to enjoy her cucumber salad dish – particularly delightful on an indian summer day. True nai nai cooking style means using the butcher knife for everything, from slicing celery to whacking a beef bone in half. According to grandma, there is no task too small for the most intimidating if all chopping devices. 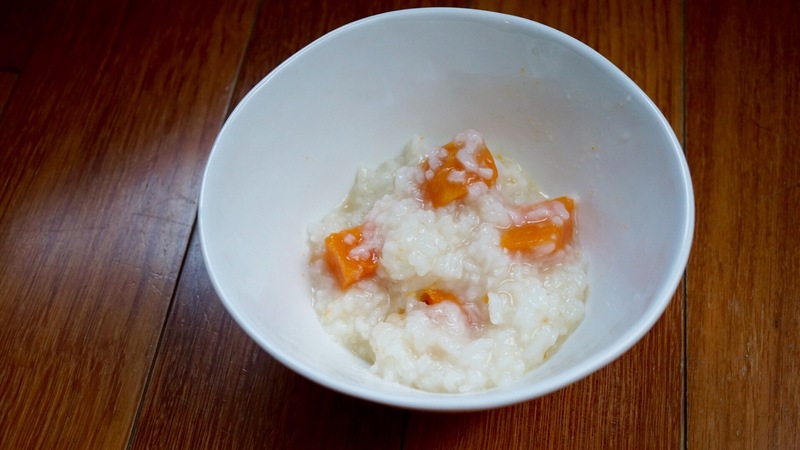 Grandma and mom came over tonight and when Nai Nai (grandma) saw my pile of yams, she couldn’t help but make a nice pot of yam and rice porridge. Porridge is so versatile, it’s a good breakfast, meal base (as it was tonight) and can even be dessert (just add lots of sugar). When we were little, my mom used to name some of her classic dishes after more westernized foods so that my sister and I would be more receptive to them. Of course, this was before I became the worldly, confident individual I am now*. At the time, as a second-generation kid growing up in America, I’d much preferred a McDonald’s Happy Meal to whatever delicious five-dish Chinese meal my mom was preparing. It took me leaving home (for college) to really appreciate the home cooking I had taken for granted all that time.